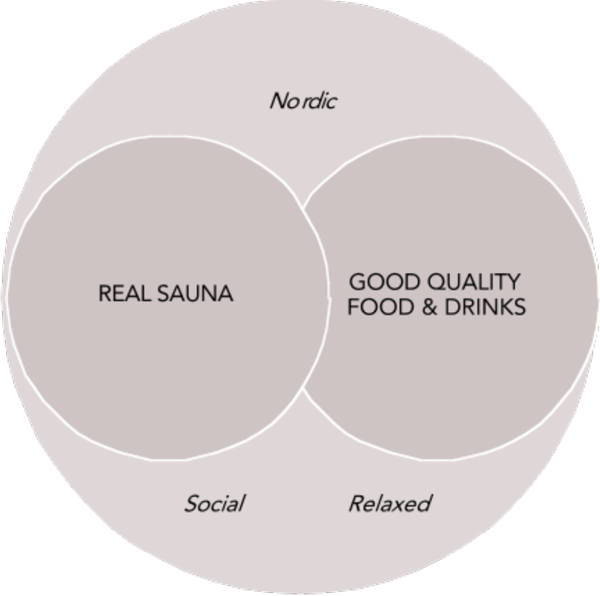 The core of our service concept is the combination of real sauna and quality food and drinks. We offer a relaxed and social atmosphere in a Nordic way. To us real sauna needs to fill four criteria: 1. Temperature is between 70 and 90 degree Celsius, 2. There is a wooden stove, 3. Water is thrown on the stove to create steam, 4. People sit on sauna benches. Our service concept leads to additional products and services that can both enhance the guest experience and generate additional income. Our services can be divided into core, value-adding and extra services. Sauna and restaurant are in the core, activities and treatments are value-adding services, whereas product sales can be seen as extras. (There are, of course, also enabling services such as booking, billing, payments etc., but these are not regarded as part of the concept overview).